The victim in one of the videos of the London riots that has most shocked the British public has been revealed as a Malaysian international student. The video shows Asyraf Haziq sitting dazed and bleeding on a London pavement, before it appears that he is helped up by one of the rioters. However, as he is being held up, another of the young rioters opens his rucksack, searches through it and pulls out his mobile phone and wallet, walking off with both of them. Today it has been revealed that the victim, Asyraf Haziq, is a 20-year-old first year student at Kaplan International College in London. On Monday evening he had gone out on his bike to get some food, only to be attacked by a group of rioters, who stole his bike and punched him in the face. He was left with a broken jaw and teeth and is currently recovering in hospital. His mother, Maznah Abu Mansor, told Malaysian website, the Star: "I was initially very worried but I'm glad that he is all right. However I am not able to talk to him because of his injuries." Ever since his identity was discovered, thousands of messages of support have been flooding in from around the UK and the rest of the world. On Twitter people have been showing their concern with the hashtag #getwellsoonashrafhaziq and a Facebook group already has hundreds of members. We were as shocked and appalled as everyone else by the video and hate that this is how a student from another country could be treated in London. 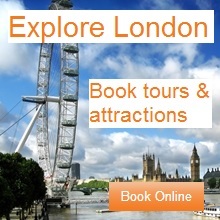 The huge support flooding in shows how appalled Londoners and Brits are by this isolated incident. 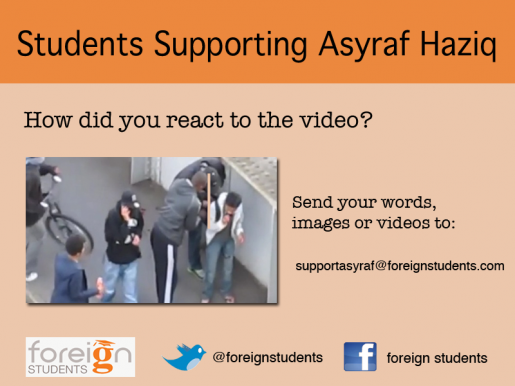 To help show our concern for Asyraf, we are collecting messages of support and reactions to the events shown in the video. Simply send the words, images or videos that best show your feelings to supportasyraf@foreignstudents.com or comment below, and we will publish them all in the coming days. UPDATE: The support for Asyraf has been bigger than anyone could have imagined. A website was set up just a few days ago asking for donations to do something nice for Asyraf and amazingly it raised £22,000 from the generous public! What's more, our campaign has been hugely successful and the outpourings of concern are so touching. We are now no longer taking any more messages to the email address, but of course, feel free to continue leaving messages below. Thank you so much for all the kind words! Over the next few days, we will collect all the messages together and present them in an amazing way. We will continue to update this page, as well as creating a new post here, so make sure you check back to stay right up to date.